About a third of all Swiss exports result from fundamental discoveries in synthetic chemistry. Certain drugs and perfumes, as well as food and agricultural products — and even Ferrari's famous red colour – are derived from new molecular structures invented by Swiss scientists. Chemists at the University of Geneva (UNIGE), Switzerland, have just discovered that chemical bonds based on antimony — a forgotten element at the very bottom of the periodic table — yield powerful new catalysts that can be used to accurately stimulate the transformation of a molecule from within. These bonds complement existing interactions such as conventional hydrogen bonds or the more recent chalcogen bonds with sulfur. This finding, published in the journal Angewandte Chemie, will lead to the creation of innovative materials that will become part of our daily lives. It has triggered a small revolution in the world of synthetic chemistry, which had always believed that there was a limit to the number of possible bonds to build new catalysts. Basic research in chemistry requires creativity. But the chemist, a true sculptor of molecular structures, needs specific tools. To induce a molecular transformation, the molecule that the scientist wants to alter — the substrate — must enter into contact with an element from the periodic table in the catalyst. Under normal conditions, the contact — or bond — used is with hydrogen. But the creative possibilities are reduced when restricted to this single element. Finding new ways to initiate contact between molecules would make it possible to transform them differently, thereby enabling chemists to create new materials. "That's why my team is constantly looking for new bonds for catalysis," explains Stefan Matile, a professor in the Department of Organic Chemistry in UNIGE's Faculty of Science. "After discovering the sulfur-based bond for catalysis, called the chalcogen, two years ago, we decided to look at another category in the periodic table, pnictogen elements, which are distinguished by their metallic components." Nitrogen, phosphorus, arsenic, antimony and bismuth all belong to this category. Unearthing new bonds for the catalysis requires innovation. "Research usually focuses on studying the electrons of the elements. We took the opposite approach: we only examined the empty spaces left by the electrons, which are essential for molecular construction, so we could look for possible new interactions", continues professor Matile. And rightly so, since heavy pnictogen elements, like ripe fruits, are more flexible and deformable than, for instance, hydrogen, which is very compact. In this way, the empty spaces become more accessible and intelligible for the chemists. Seven elements were chosen by the UNIGE scientists. "Theoretical calculations make for a better visualisation of the empty spaces," says Amalia I. Poblador-Bahamonde, a researcher in the Organic Chemistry Department in the Faculty of Science. "That's why we first carried out computer modeling of the seven elements alone so we could visualise where both the electrons and the empty spaces were located. We then did it again with the molecules to be tested in order to measure the strength of the new bond." The more visible the molecule's empty spaces became, the better the bond works, and the element is a better catalyst. At this theoretical stage, antimony turned out to be the best of the seven elements tested. The findings encouraged the chemists to focus on elements at the bottom of the periodic table, an area that is little explored in organic chemistry. 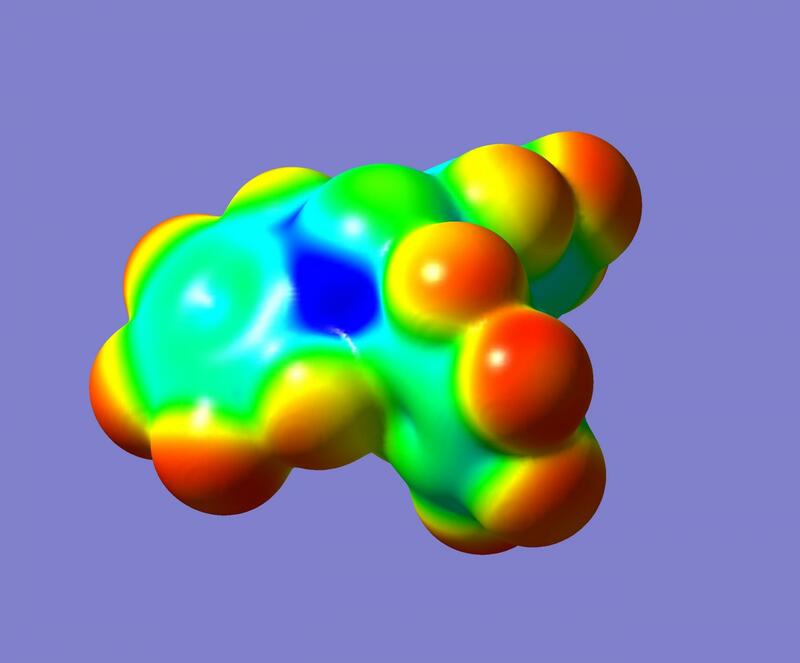 Basing their work on the theoretical modeling, the chemists studied the bonds using nuclear magnetic resonance, which makes it possible to visualise the molecules and the transformations in their structure. "Our results were perfectly consistent with the theoretical predictions," points out Sebastian Benz, a PhD student in professor Matile's team. "Antimony proved to be ultra-efficient once more, up to 4,000 times faster than the other elements tested in creating a new structure!" Antimony turned out to be a surprise for the UNIGE researchers. It was used as eye makeup in ancient Egypt before falling into oblivion. This research puts the element firmly back into the spotlight, all thanks to the exceptional qualities it showed for molecular transformation. "Antimony is not only ultra-fast but also – unlike other catalysts that act on the molecule's surface – it works from within. This impacts on the material's entire environment and enables the chemist to be more precise when undertaking the transformations," continues professor Matile. The pnictogen bonds with antimony are the third bonds for catalysis discovered by the UNIGE chemists, following anion-π bonds and chalcogen bonds with sulfur. All three introduce new ways of looking at molecular transformations and open up untried prospects. "We don't intend to stop there, of course: we're going to keep on looking for new bonds and ways in which we can make use of them!" says professor Matile. Illustrative examples for these bright perspectives are the first enzymes that work with anion-π bonds, made in the National Centre of Competence in Research (NCCR) Molecular Systems Engineering, and the first fluorescent probes that can visualise mechanical forces in living cells thanks to chalcogen bonds with sulfur, made in the NCCR Chemical Biology at UNIGE.